A beautiful dalmatian. With her partner Pongo, she takes care of 99 dalmatian puppies. Perdita will brave any danger to protect her spotted charges. A female dalmatian who marries Pongo and now lives with ninety-nine puppies. 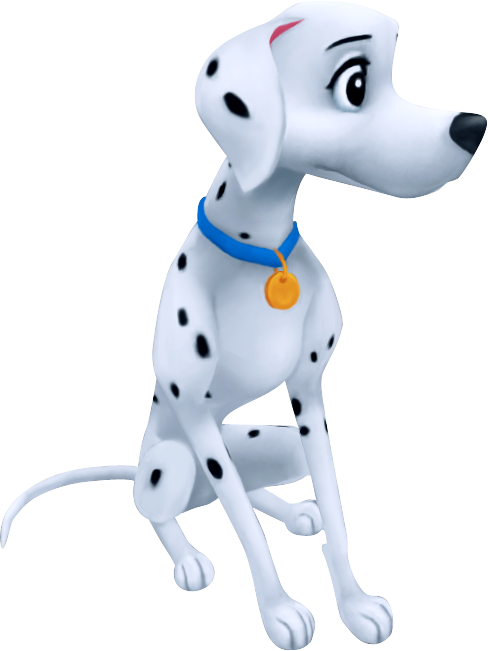 Perdita is a female dalmatian who appears in Kingdom Hearts, having been transported to Traverse Town with her mate, Pongo. She is the mother of the 99 puppies that Sora must locate throughout Kingdom Hearts. Prior to the events of Kingdom Hearts, Perdita's world was destroyed by the Heartless. With her husband Pongo, she escaped through a Corridor of Darkness to reach Traverse Town. However, Perdita's owners, Roger and Anita, disappeared during the destruction. To add to her worries, all ninety-nine of Perdita's puppies were separated and scattered across other worlds. The story of the dalmatians' plight managed to spread very quickly amongst the residents of Traverse Town. Leon was especially concerned about the matter, and brought it to Sora's attention. Throughout his journey, Sora found the dalmatian pups and sent them back to Perdita in Traverse Town. To show how grateful she and Pongo were, she gave Sora gifts for his journey as he continued to find more puppies. When Sora sealed Kingdom Hearts, Perdita, along with Pongo and all of her children, returned home. Perdita is a typical dalmatian with white fur that is speckled with black spots. She wears a blue collar, as do all of her daughters, while her husband and sons wear red collars. Perdita is a very protective mother and is despondent at the loss of her puppies in Kingdom Hearts. She constantly frets for the safety of her pups, and keeps a very close watch on them. Perdita first appeared in Walt Disney's 101 Dalmatians, which in turn was inspired by the book The Hundred and One Dalmatians by Dodie Smith, which was published in 1956. Disney's Perdita is actually a hybrid of the characters Perdita and Missis from the original book. Missis is Pongo's wife, while Perdita is a stray taken in by the family to help care for Missis's original fifteen puppies, away for Cruella De Vil. This page was last edited on 7 September 2018, at 22:17.